A day after House Minority Leader Nancy Pelosi (D., Calif.) was drilled by Meet The Press host Chuck Todd on whether her party's leadership was out of touch with the current political climate the nearly three-decade veteran of Congress mistakenly referred to President Donald Trump as "President Bush." "While its only been a couple of weeks since the inauguration, we've seen nothing that I can work with President Bush on," said Pelosi during a Monday press conference. It appears that members standing behind Pelosi noticed the mistake but chose not to correct or interrupt her. It remains unclear, however, exactly which "President Bush" the minority leader was referring to. The minority leader was seemingly confusing the current president with President George W. Bush, who has not been in office for eight years. Pelosi, however, was also in office during the administration of President George H.W. Bush, who was in office 24 years ago. The senior moment came just after comments by Sen. Elizabeth Warren (D., Mass. ), who in a speech over the weekend indicated her belief that Democratic leadership has lost touch with the current electorate. "Does the Democratic Party need new leaders to touch base on this stuff?" NBC's Todd asked Pelosi after showing a clip of Warren's speech. "Whether it's Hillary Clinton, yourself, Chuck Schumer—you've all been in power a long time and there was a rejection of that in the 2016 election." "We have plenty of room for all kinds of leadership at every level, but right now we need experience as well," said Pelosi. Pelosi then stated that she too was once a "new leader." 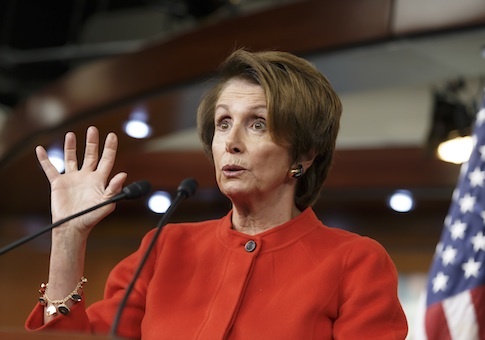 "I was a new leader when I emerged myself, so I'm all for that," Pelosi said. This entry was posted in Politics and tagged Democratic Party, Elizabeth Warren, Nancy Pelosi. Bookmark the permalink.